Reporting the original feature in each file. How many base pairs of overlap were there? Counting the number of overlapping features. Require a minimal fraction of overlap. Faster analysis via sorted data. Intersecting multiple files at once. Count the number of overlapping intervals. Merging features that are close to one another. Listing the name of each of the exons that were merged. A Jaccard statistic for all 400 pairwise comparisons. Puzzles to help teach you more bedtools. 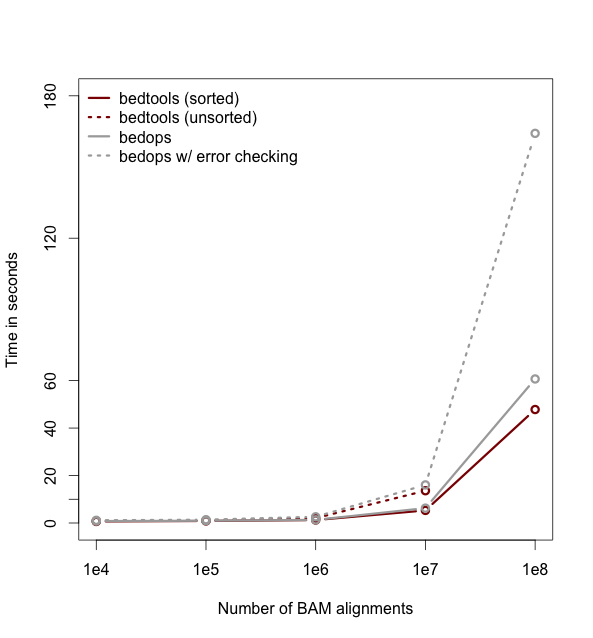 Our goal is to work through examples that demonstrate how to explore, process and manipulate genomic interval files (e.g., BED, VCF, BAM) with the bedtools software package. Some of our analysis will be based upon the Maurano et al exploration of DnaseI hypersensitivity sites in hundreds of primary tissue types. Maurano et al. Systematic Localization of Common Disease-Associated Variation in Regulatory DNA. Science. 2012. Vol. 337 no. 6099 pp. 1190-1195. This tutorial is merely meant as an introduction to whet your appetite. There are many, many more tools and options than presented here. We therefore encourage you to read the bedtools documentation. From the Terminal, create a new directory on your Desktop called bedtools-demo (it doesn’t really matter where you create this directory). Download the sample BED files I have provided. Now, we need to extract all of the 20 Dnase I hypersensitivity BED files from the “tarball” named maurano.dnaseI.tgz. Let’s take a look at what files we now have. Your directory should now contain 23 BED files and 1 genome file. Twenty of these files (those starting with “f” for “fetal tissue”) reflect Dnase I hypersensitivity sites measured in twenty different fetal tissue samples from the brain, heart, intestine, kidney, lung, muscle, skin, and stomach. In addition: cpg.bed represents CpG islands in the human genome; exons.bed represents RefSeq exons from human genes; gwas.bed represents human disease-associated SNPs that were identified in genome-wide association studies (GWAS); hesc.chromHmm.bed represents the predicted function (by chromHMM) of each interval in the genome of a human embryonic stem cell based upon ChIP-seq experiments from ENCODE. The latter 4 files were extracted from the UCSC Genome Browser’s Table Browser. In order to have a rough sense of the data, let’s load the cpg.bed, exons.bed, gwas.bed, and hesc.chromHmm.bed files into IGV. To do this, launch IGV, then click File->Load from File. Then select the four files. IGV will warn you that you need to create an index for a couple of the files. Just click OK, as these indices are created automatically and speed up the processing for IGV. Visualization in IGV or other browsers such as UCSC is a tremendously useful way to make sure that your results make sense to your eye. Conveniently, a subset of bedtools is built-into IGV! The intersect command is the workhorse of the bedtools suite. It compares two or more BED/BAM/VCF/GFF files and identifies all the regions in the gemome where the features in the two files overlap (that is, share at least one base pair in common). By default, intersect reports the intervals that represent overlaps between your two files. To demonstrate, let’s identify all of the CpG islands that overlap exons. NOTE: In this case, the intervals reported are NOT the original CpG intervals, but rather a refined interval reflecting solely the portion of each original CpG interval that overlapped with the exon(s). The -wa (write A) and -wb (write B) options allow one to see the original records from the A and B files that overlapped. As such, instead of not only showing you where the intersections occurred, it shows you what intersected. The -wo (write overlap) option allows one to also report the number of base pairs of overlap between the features that overlap between each of the files. We can also count, for each feature in the “A” file, the number of overlapping features in the “B” file. This is handled with the -c option. Often we want to identify those features in our A file that do not overlap features in the B file. The -v option is your friend in this case. Recall that the default is to report overlaps between features in A and B so long as at least one basepair of overlap exists. However, the -f option allows you to specify what fraction of each feature in A should be overlapped by a feature in B before it is reported. Let’s be more strict and require 50% of overlap. So far the examples presented have used the traditional algorithm in bedtools for finding intersections. It turns out, however, that bedtools is much faster when using presorted data. As of version 2.21.0, bedtools is able to intersect an “A” file against one or more “B” files. This greatly simplifies analyses involving multiple datasets relevant to a given experiment. For example, let’s intersect exons with CpG islands, GWAS SNPs, an the ChromHMM annotations. Now by default, this isn’t incredibly informative as we can’t tell which of the three “B” files yielded the intersection with each exon. However, if we use the -wa and wb options, we can see from which file number (following the order of the files given on the command line) the intersection came. In this case, the 7th column reflects this file number. Additionally, one can use file “labels” instead of file numbers to facilitate interpretation, especially when there are many files involved. Many datasets of genomic features have many individual features that overlap one another (e.g. aligments from a ChiP seq experiment). It is often useful to just cobine the overlapping into a single, contiguous interval. The bedtools merge command will do this for you. The merge tool requires that the input file is sorted by chromosome, then by start position. 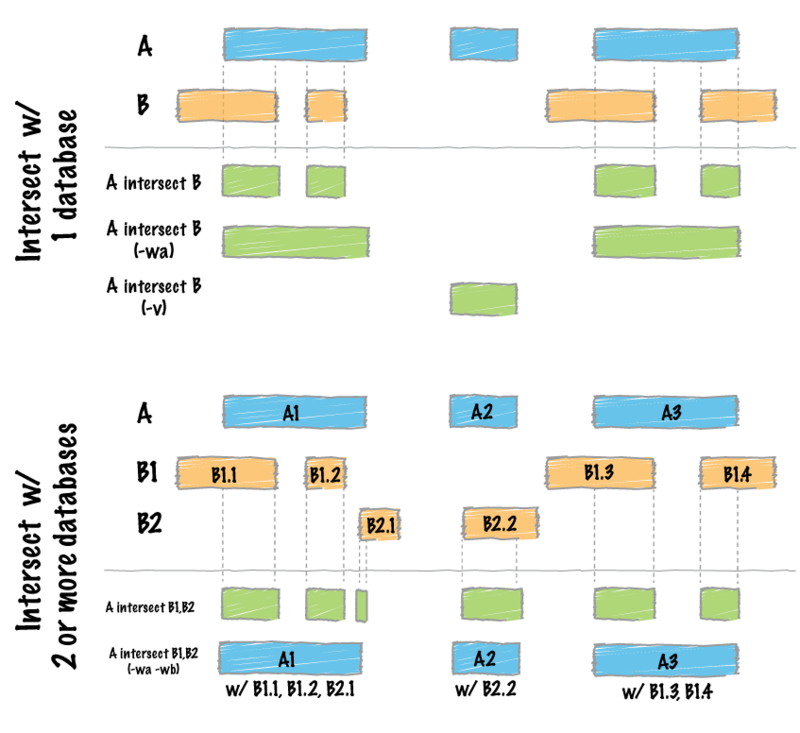 This allows the merging algorithm to work very quickly without requiring any RAM. Merging results in a new set of intervals representing the merged set of intervals in the input. That is, if a base pair in the genome is covered by 10 features, it will now only be represented once in the output file. A more sophisticated approach would be to not only merge overlapping intervals, but also report the number of intervals that were integrated into the new, merged interval. One does this with the -c and -o options. The -c option allows one to specify a column or columns in the input that you wish to summarize. The -o option defines the operation(s) that you wish to apply to each column listed for the -c option. For example, to count the number of overlapping intervals that led to each of the new “merged” intervals, one will “count” the first column (though the second, third, fourth, etc. would work just fine as well). We often want to know which intervals of the genome are NOT “covered” by intervals in a given feature file. For example, if you have a set of ChIP-seq peaks, you may also want to know which regions of the genome are not bound by the factor you assayed. The complement addresses this task. For many analyses, one wants to measure the genome wide coverage of a feature file. For example, we often want to know what fraction of the genome is covered by 1 feature, 2 features, 3 features, etc. This is frequently crucial when assessing the “uniformity” of coverage from whole-genome sequencing. This is done with the versatile genomecov tool. 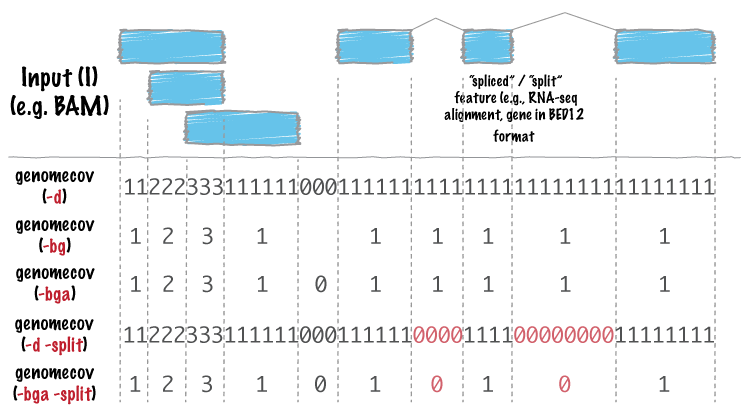 As an example, let’s produce a histogram of coverage of the exons throughout the genome. Like the merge tool, genomecov requires pre-sorted data. It also needs a genome file as above. Analytical power in bedtools comes from the ability to “chain” together multiple tools in order to construct rather sophisicated analyses with very little programming - you just need genome arithmetic! Have a look at the examples here. 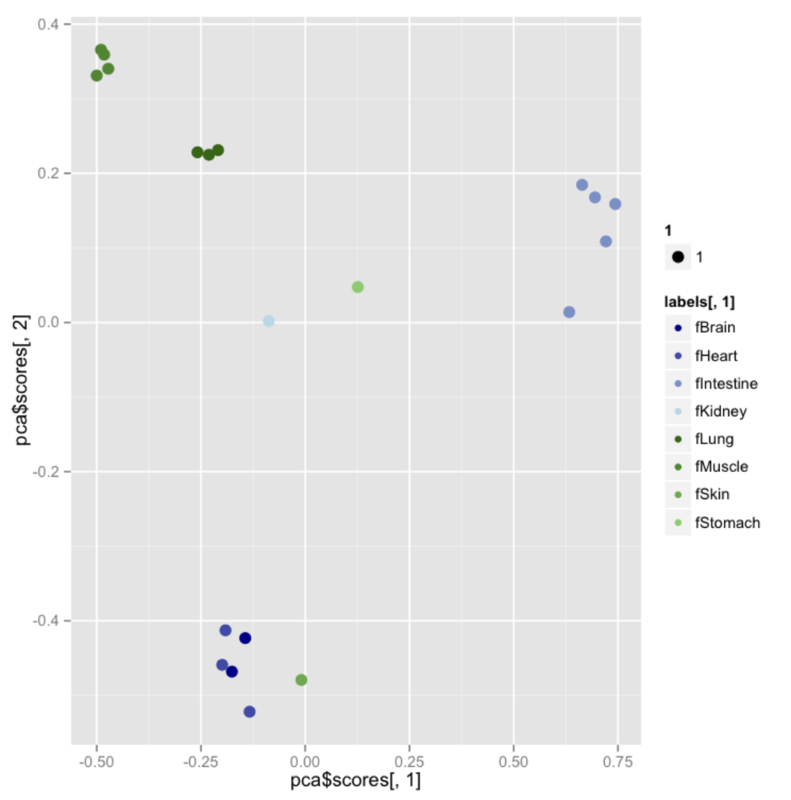 Assessing the breadth and depth coverage of sequencing coverage in exome studies. We will use the bedtools implementation of a Jaccard statistic to meaure the similarity of two datasets. Briefly, the Jaccard statistic measures the ratio of the number of intersecting base pairs to the total number of base pairs in the two sets. As such, the score ranges from 0.0 to 1. 0; lower values reflect lower similarity, whereas higher values reflect higher similarity. But what about the similarity of two different tissue types? Hopefully this demonstrates how the Jaccard statistic can be used as a simple statistic to reduce the dimensionality of the comparison between two large (e.g., often containing thousands or millions of intervals) feature sets. We are going to take this a bit further and use the Jaccard statistic to measure the similarity of all 20 tissue samples against all other 20 samples. Once we have a 20x20 matrix of similarities, we can use dimensionality reduction techniques such as hierarchical clustering or principal component analysis to detect higher order similarities among all of the datasets. We will use GNU parallel to compute a Jaccard statistic for the 400 (20*20) pairwise comparisons among the fetal tissue samples. But first, we need to install GNU parallel. Next, we need to install a tiny script I wrote for this analysis. Now, we can use parallel to, you guessed it, compute the 400 pairwise Jaccard statistics in parallel using as many processors as you have available. This command will create a single file containing the pairwise Jaccard measurements from all 400 tests. Now let’s make a 20x20 matrix of the Jaccard statistic. This will allow the data to play nicely with R.
Let’s also make a file of labels for each dataset so that we can label each dataset in our R plot. Note that PCA was used in this case as a toy example of what PCA does for the CSHL Adv. Seq. course. Heatmaps are a more informative visualization in this case since Jaccard inherently returns a measure of distance. So let’s make a heatmap for giggles. Create a BED file representing all of the intervals in the genome that are NOT exonic. Are there any exons that are completely overlapped by an enhancer? If so, how many? What fraction of the GWAS SNPs are exonic? What fraction of the GWAS SNPs are lie in either enhancers or promoters in the hESC data we have? 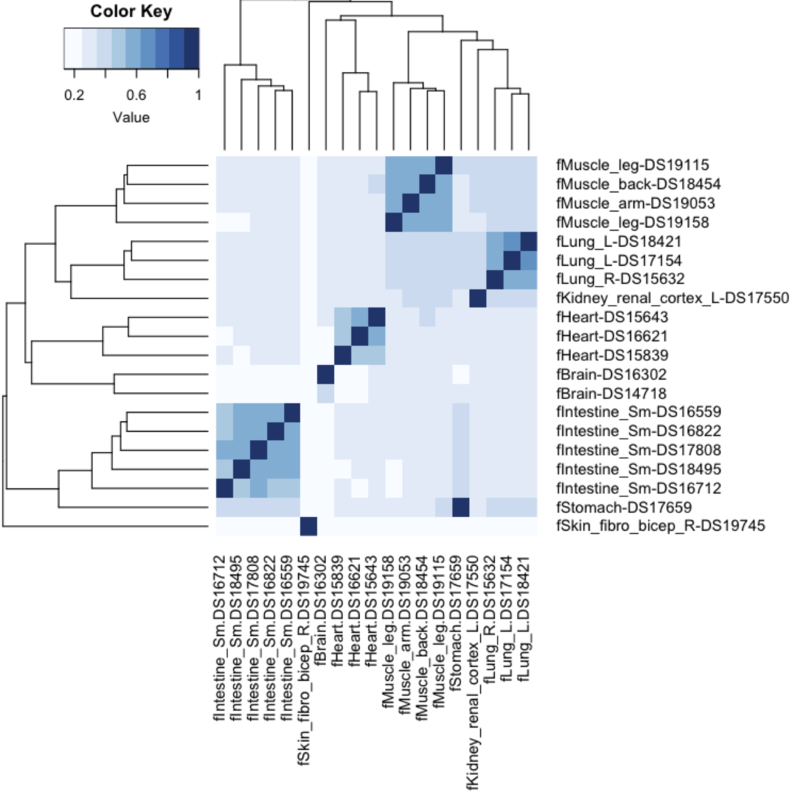 What is the Jaccard statistic between CpG and hESC enhancers? Compare that to the Jaccard statistic between CpG and hESC promoters. Does the result make sense? (Hint - you will need grep).